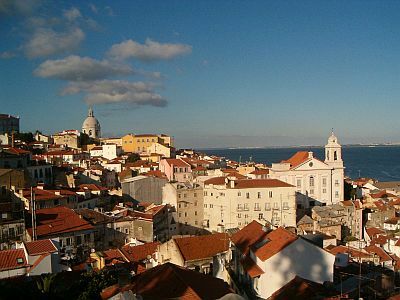 In Lisbon, the capital of Portugal, the climate is Mediterranean, mild and rainy in winter, warm and sunny in summer. The location, in the far west of Europe and overlooking the ocean, makes the climate particularly mild, compared with other European cities. Here are the average temperatures. Rainfall amounts to 710 millimeters (28 inches) per year, and follows the Mediterranean pattern, in fact it is abundant in autumn and winter, moderate and less frequent in spring, and very scarce in summer. During some years, autumn and winter can be particularly rainy. Here is the average precipitation. Winter, from December to February, is mild: the average temperature in January is 11.5 °C (52.5 °F). Daytime temperatures are generally mild, around 15/16 °C (59/61 °F). The westerly winds prevail, bringing quite frequent rains, sometimes abundant, and windy conditions. 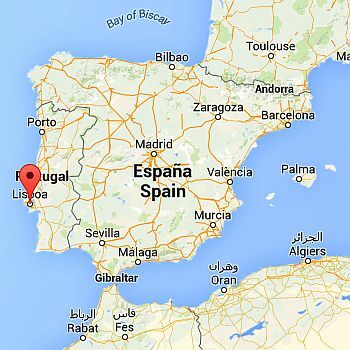 There are also periods of good weather, since the Azores anticyclone can move over Portugal also in winter. Very cold days are rare: sometimes there can be short periods with temperatures about 2/3 °C (36/37 °F) at night and about 8/10 °C (46/50 °F) during the day; the temperature never drops below freezing, in fact the coldest record is 0 °C (32 °F). Snow is a very rare phenomenon: someone still remembers the snowfall of 1954, while a more recent snowfall, though less intense, occurred in 2006. Spring, from March to May, is mild, with some periods of bad weather, which become rare from the second half of April, while nice weather becomes more and more frequent. Summer, from June to mid-September, is warm and sunny: the average temperature reaches 23.5 °C (74.5 °F) in August, so it is not too high, in addition, the breeze blows from the ocean, tempering the heat. The clearness of the air shows that we are not on the Mediterranean coasts, where summer tends to be more hot and muggy. Typically, the temperatures are pleasant, in fact highs don't reach 30 °C (86 °F) and lows are below 20 °C (68 °F), although there can even be hot periods due to African air masses: in these cases the temperature can reach 36/38 °C (97/100 °F), and sometimes up to 40 °C (104 °F). Autumn, from mid-September to November, is initially warm and sunny, then gradually becomes milder, while waves of bad weather become more frequent. November is a rainy month. The amount of sunshine in Lisbon is very good in summer, when the weather is almost always sunny; it's also good in spring and early autumn, while in late autumn and in winter there are cloudy periods, shorter or longer, alternating with sunny periods. The sea in Lisbon is definitely cool to swim in, or a little cold, even in summer: the water temperature reaches 18 °C (64 °F) in June, 19 °C (66 °F) in July, and 20 °C (68 °F) in August and September. Here are the average sea temperatures. The best months to visit Lisbon are May, June and September, in fact they are generally mild or pleasantly warm, and sunny as well. The temperature is generally acceptable also in July and August, but there is a higher risk of hot days.